Jesus asks you questions in the Scriptures. Have you answered them? How many times have you asked questions such as these but never took the time to seek the answer? And not just any answer — a Catholic answer! With wit and enthusiasm, Fr. 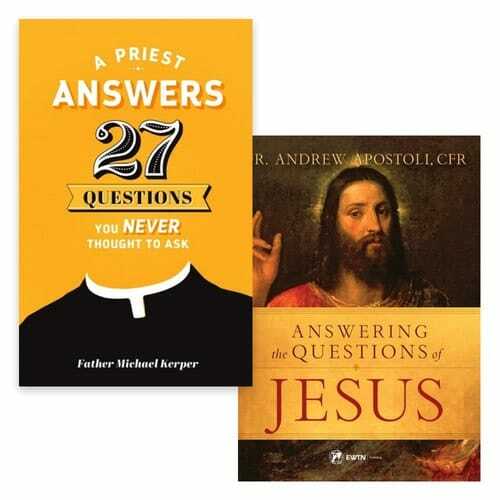 Michael Kerper — a popular Catholic priest in New England — tackles over two dozen such questions in this fast-paced and thoroughly enjoyable book. He tackles each question head-on, relying on Scripture, tradition, the Catechism, and the writing of the saints. Read this book, and you’ll soon be armed with little-known knowledge that will fascinate and impress all those who have never taken the time to seek the Catholic answer. Do you love me? How the reconciliation of Peter and Jesus should give us courage and fortitude. I wrote a less than endorsing review on this book before I really read through it properly. Now that I have thoughtfully read it, I would like to change my review from 3 stars to 5. I still think this is a good book for group study but it is also a wonderful book for individual reading and reflection. Father Apostoli gives great insight and depth to the questions that Jesus asks in the Holy Scriptures of His disciples and of us. I'm glad I purchased this book and will reread it again.